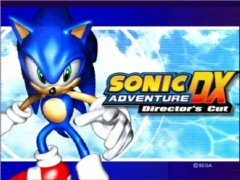 Last week DecoyChunk reviewed Sonic Adventure for XBLA here. Once I was satisfied that visually there was zero appreciable difference between the two versions, I cast my glance towards the gameplay. Now, it has to be stated that I prefer the Xbox 360 controller for 3D platformers and maneuvering in 3D based games generally because of the focus the main analog stick has on the 360 controller. Whereas the symmetry offered on the DualShock 3 may appear to be better, I’ve always felt the analog sticks for the dualshock have been tacked on in response to the N64 controller. Having explained that, I prefer the controls on the XBLA version over the PSN version. I sat down for over two hours playing between the two versions and stuff I fumbled with on the PS3 version, I fumbled less on the Xbox version. And to make sure it wasn’t just because I was used to the level or anything, I alternated play of new levels between the platforms and the Xbox version just controlled better. This could just be my preference to the Xbox 360 controller, but I never had problems so pronounced on other multiplatform games which just leads me to believe that controls should have been fine-tuned a bit better for the PSN release. There are a lot of factors that could make this the case, such as Sonic Adventure is played at a blistering fast pace and adjusting your trajectory with even a modest budge can screw your control over the game. I leaned extremely heavily on the auto jump-attack to fix myself to a course I wished to take and that greatly alleviated a good portion of the troubles and frustrations caused with the controls. Having said all that, I think if they spent a little more time with adjusting the controls for each platform, the experience could be much more engaging. Again, my preference is still with the 360 version. Audio wise, there is just something about SEGA melodies that just screams “ARCADE” to me. From the menu voices, even to the hammy voice acting just make it feel like I could be playing this in an arcade somewhere. Also, the only time I refer to BGM is with SEGA titles. Space Harrier, OutRun and AfterBurner all share the same intonation to the background music in Sonic Adventures. This isn’t to say it’s bad in any sense, just quintessentially SEGA and oddly appropriate regardless of game mode and level you are on. Now the one major difference between the PSN version we reviewed and the XBLA version we reviewed, is the PSN version comes with the DLC: the Director’s Cut. I kind of admire what SEGA has done here. First, they are testing the waters by re-releasing DreamCast Hits, I believe Crazy Taxi will be the next game ported over to the Digital Distribution markets. Second, they priced it perfectly. Think about this for a second. SEGA ported over a classic DreamCast game, increased the visuals (or kept the visuals the GameCube and PC versions had) and added achievement/trophy support for $9.99. If you are a Sonic Die-hard you can buy the DX DLC for $4.99 which adds another playable character and 60 new missions. That’s quality DLC. And the kicker is the *full* price matches what featured XBLA and PSN titles are going for: $15 Bucks. It should be noted that the original DX ports for the PC and GameCube offered a minigame collection that showcased Twelve Sonic GameGear games and the GameCube version offered a way to send a Chao pet to your GBA through the GBA link on your Gamecube. It’s a little upsetting that we don’t get these add-ons, but I can understand why they didn’t make the cut. Though, it would be stupid cool if SEGA found a way to link the old DreamCast VMU stuff to the new Windows Phone 7 devices coming out or even to the PSP via remote play on the PS3 but, I digress. Ultimately, I whole-heartedly approve of SEGA porting all the DreamCast classics to the newer systems. Hopefully, sales are good enough to convince other companies, *cough* CAPCOM *cough* to port something like *cough* Power Stone *cough* to XBLA and PSN. I mean, come on, Online Multiplayer in Power Stone, it’s what we’ve all been waiting for. 6.8 / 10. Very similar to the XBLA version, but in my opinion, doesn’t control as well as the XBLA version. Still, a solid title.